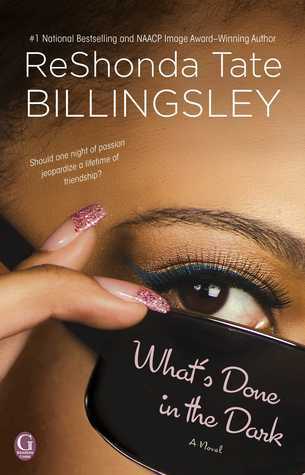 What’s Done in the Dark by ReShonda Tate Billingsley is easily among my favorite reads for this year. In this book, you get good writing, a solid story line, and great messages to help us all navigate through life. The quick rundown: Felise and Paula are best friends. Felise is harboring a secret so devastating that once it’s revealed, she knows her life, marriage and friendship with Paula will never be the same. Felise shares a hot night of passion with Paula’s husband, Stephen, but he doesn’t wake up after their intimate encounter. Filled with guilt, will Felise keep this secret forever, or will what’s done in the dark be revealed? Alright, alright, you all know by now that of course the secret gets revealed! It’s what happens afterwards that is what makes this book so good. I do feel a bit bad about telling you all this, but I feel the synopsis pretty much told us all the deal already. Anyway, this book is about forgiveness. That’s right. Forgiveness. And reminding ourselves that every action has a consequence, whether it’s a good one or a bad one. In addition, I also got from the book how we lie and convince ourselves to do things that we really do not want to do. For instance, Paula and Stephen really didn’t love each other like a man and wife are supposed to but got married out of obligation. I also think Felise settled with Greg. Let me add here that I did not like Greg at all! I think their marriage was doomed from the start and was only a matter of time before it ended. As you can tell, this book is deep, as well as entertaining. So, in short, I think readers will really enjoy this book about trying to keep secrets and forgiveness. Check it out!